Witness to War is an eye-catching retelling of the war experience through private diaries kept by people from all walks of life and from many countries. The Second World War announced its arrival from distance and as early and spring-1938 city-dwellers across Europe expected destruction on an epic scale. Men, women and children, most of whom had never kept a diary before, began to chronicle their own responses to what they knew would be a unique moment in world history. The cast of characters these diaries - more than three hundred in number - range from politicians, soldiers and spies to ordinary citizens and housewives, from a London schoolboy watching V-1 doodlebugs from his bedroom window to an interned German refugee robbed and beaten by British troops. Many others are famous, and this collection included rare material from figures such as Joseph Goebbels, Joyce Grenfell, Jean-Paul Sartre, Evelyn Waugh and Noel Coward. 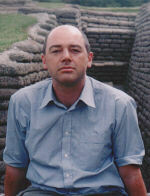 It also contains the diaries of many who were close to Winston Churchill and Adolph Hitler. Most of these diaries involved a degree of dangers and secrecy. In occupied Europe keeping a diary could betray friends and relatives to the enemy. Some were downright illegal, such as those kept by soldiers in the frontline. More than half a century after the end of the war these hidden treasures - the voices of the past - are still being unearthed. Many of these accounts languished unread, unpublished and gathering dust in scholarly archives around the world. This is war at first hand described in its most immediate terms, not mediated through the voice of peripheral observers or fading memory or political allegiances. Diaries kept on regular basis - especially those not artfully rewritten for posterity - capture the immediate and often surprising through of participants caught up in the first truly global war. "Witness to War stands head and shoulders above all the other books that are flooding out to meet the 60 th anniversary of the end of the last world war…He takes care to spread his selection from the highest quarters – on both sides – to the most humdrum, and gives an excellent picture of a world in agony." "Of the four editors, Aldrich emerges on top; he understands better than the others the general shape of the war. From his chair at Nottingham he has already established himself as a leading figure in the world of intelligence studies; here he shows himself a first-rate military his torian as well. He introduces each month with a judicious summary of its main events. Moreover he has collected outstanding illustrations.'" 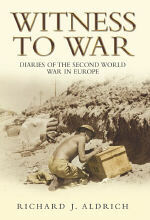 "It’s a magnificent achievement – and we’re only halfway through: Aldrich’s book is confined to Europe and the Middle East, and we’ll have to wait another year for his collated diaries from the war in the Pacific." "Aldrich has performed a great service with research which unfolds the drama of global conflict by quoting those who were most affected. The beauty of this volume – a second is promised next year on the Far East – is the variety of flashpoints that it explores through a chronological link." "From just about every page I got the feeling that this is how it really was; that this is what really happened. I can think of no higher compliment." "Fascinating stuff in the words of those who were there."